Below are 2019 events and press for Sug. O’Shen. Events and press are added and updated monthly. Miami Art Week, Superfine Exhibit - Dec 2018 - (The artworks which were exhibited during Art Week Miami will be available for sale beginning April 1, 2019) Miami Art Week on South Beach will take place at the Art Deco Welcome Center on Ocean Drive, Dec. 5-9, 2018. Exhibiting top emerging and established artists of 2018. Showcasing my new global ocean series of work. Morehouse MacDonald and Assoc. 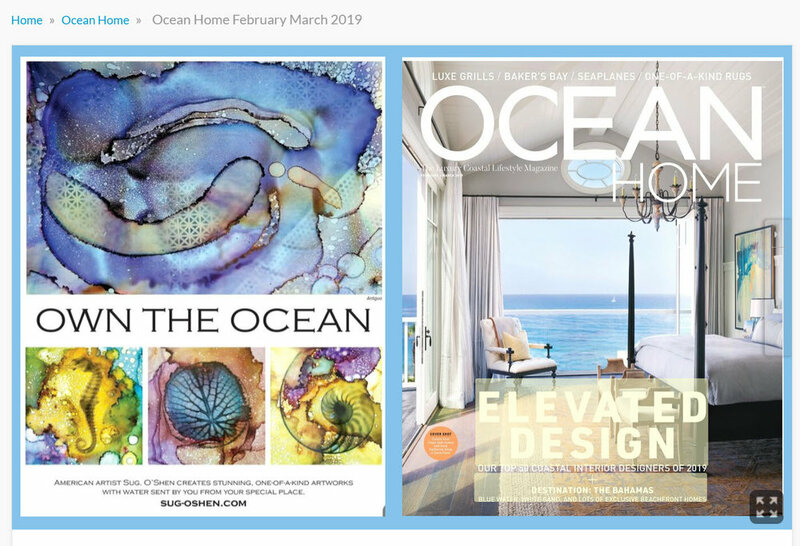 -April 2019- MMA has partnered with global artist, Sug O’Shen and Ocean Home magazine to celebrate its newly revamped website. It’s time you joined in on the celebration! Visit the new site and you could be one of 9 winners to receive an annual subscription for Ocean Home magazine or you could be one lucky, grand prize winner to receive a print of Sug O’Shen’s, St. Barts II.